The following article is taken from John Petrucci's classic "Wild Stringdom" column in Guitar World. Last summer, Dream Theater played some outdoor festivals in Europe that also featured Elton John and Rod Stewart. Rod was touring with a full orchestra, and backstage there were little booths set up where the musicians in the orchestra could warm up. As I was walking around, I heard a violinist playing these wild exercises-he was wailing! I thought it would be really cool to adapt those licks to the guitar. Since the violinist didn't speak any English, I had to gesture for him to show me what he was doing. He gladly did, and then he showed me a bunch of variations, too. It was great; though we didn't speak, we nonetheless communicated very easily. The warm-ups my violinist friend showed me are difficult to play on guitar, but incredibly beneficial when mastered. A violin neck is much smaller than the guitar's, so it's much easier to play wide intervals on one violin string. On the guitar, you really have to stretch to play them. And that's where these exercises will really help. To play FIGURE 1 you need to work on stretching between the first and second fingers. Play each pattern four times, move it chromatically up the neck to the 12th position and then descend, as in FIGURE 2. FIGURE 3 works the stretch between your ring finger and the pinkie. Then, if you really want to be challenged, play FIGURE 4, which introduces a multiple stretch. Once you master these exercises individually, try playing FIGURE 5, which combines all the stretching patterns in one position into a mega-exercise that moves up chromatically. This one's a real workout, and will really warm up your hands. 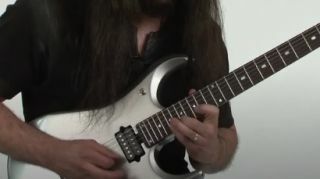 When you're done with the low E string, play this exercise on the remaining strings. Now, you may be asking yourself why you would need to practice exercises that are clearly technical in nature. Well, the obvious benefits are that you're using all four left-hand fingers and developing right- and left-hand synchronization skills. But there's another important reason: guitar playing benefits from a certain amount of daily maintenance. It's kind of like exercising-it's a lot more beneficial for you to exercise every day instead of doing nothing and then one day working out for five hours. There was a time when I used to practice all the left-hand chromatic permutations daily. Of course that was when I was 16 years old and without a care in the world. But as I got older and started getting more responsibilities, my schedule got compressed to the point where on certain days I hardly had any time to practice at all. That was where playing musical pieces or exercises that incorporate a lot of things into one comprehensive study (such as the ones in this month's column) became both beneficial and time-saving. By playing studies such as these, I'm able to maintain my technique. And, as an added bonus, they're ideal for warming up right before I go onstage. Musically, what can you do with these exercises? Plenty! Just check out what Chopin did with chromatic passages! And if you apply the sequences we learned here to any scale, you can come up with many cool melodic ideas.